When inspiration runs dry and you get a case of the blues, whether writer’s block is operating on the background or frustration knocks at your door, productivity suffers and boredom settles in – life’s loses its luster, gray days abound, and opaque hours seem to stop time. This may happen to anyone, at any time; I have been there. I want to share with you a simple system I came up with that will help you fight those blues and keep you from becoming bored or uninspired. I assure you that you will always have something to dream about, something to be grateful for, and something to do. That in itself can jumpstart your inspiration. I call this system my Inspirational Jars, and that is just what it is. 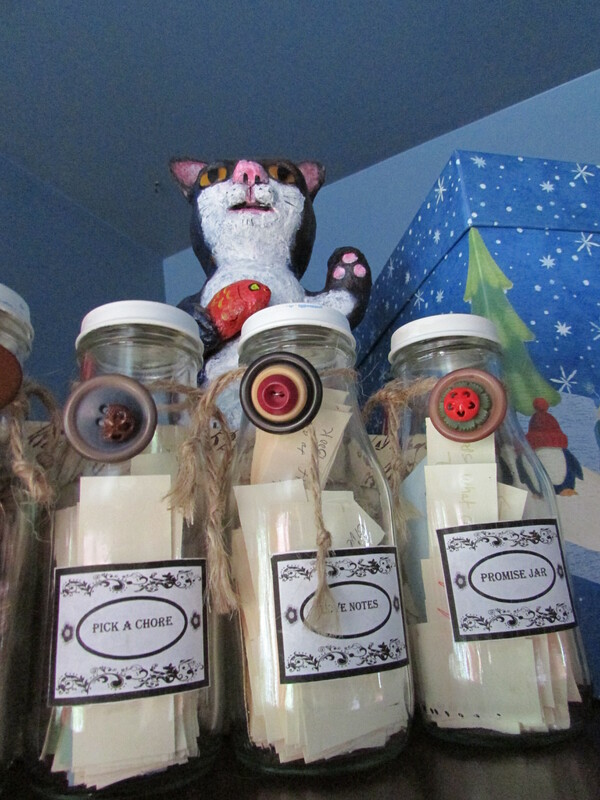 I use three empty glass jars and I label each one – Love Notes, Pick a Chore, and Promise Jar. Each Jar has a purpose; each jar gives me something to do. PICK A CHORE – I fill this jar with all kinds of single chores written in small cards (make them colorful for fun and visual impact). I write as many things that come to mind that I have to do, whether soon or in a near future. LOVE NOTES – In this jar, I write the things that I would like to do for others (in small cards so they fit in the jar), whether it is to make a gift, visit someone, call someone, invite someone to dine, wash my husband’s truck … It is all about giving and Love. PROMISE JAR – This jar is very important to me because it contains many dreams and things that I want or love to do. Things that are in a distant future or things that I can do right away. It doesn’t matter how big the dream is; it goes inside that jar. The idea is to sit down and write as many small cards you can and fill those bottles, and if one day you think of something else, just write it and deposit it in the bottle. If you ever feel bored, uninspired, and not knowing what to do, pick one card from one of the bottles and do/dream/plan/execute whatever you wrote on that card. If it is something you cannot do now, you can always put it back and pick a card from another bottle or from the same jar, or you can sit down and dream/plan how to work towards that dream or goal. You will never ran out of things to do if you keep filling those inspirational jars. Make them pretty, colorful and enticing. Have fun creating this system. Create your own system depending on what you want to do. For example, a jar for blogging topics, a jar for writing scenes or character names … Mine are just what I use to keep productivity and inspiration alive. Here is what my Inspirational Jars look like. I hope that you enjoyed this tip.